If love between a woman and a cephalopod is wrong, I don't want to be right. I am not particularly good at most games in the "bumblecore" genre. I don't get the appeal of QWOP, and I found Surgeon Simulator to be funny for a few minutes, but quickly it became tiresome. However, Octodad manages to take the sort of weird, often frustrating controls of this genre and turn them into something fun and charming rather than irritating. I used an Xbox controller and quickly mastered walking and basic interaction with the environment. Throwing stuff still felt a bit awkward, but there really wasn't much use for the throwing mechanic in the game. 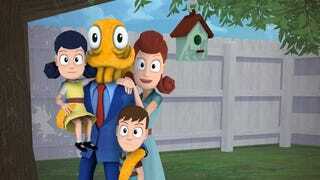 Octodad is a bit on the short and easy side, if I'm being honest. I played it start to finish in an afternoon. I don't know that this is a terrible thing, as overly difficult games like this tend to just get frustrating. Still, I was left wanting more. There are some free DLC "shorts" that I might check out to help extend the experience. Octodad takes some complicated controls and a heartfelt story, and tells a slapstick comedy adventure with them. It's a fun and funny way to spend $5 and an afternoon. Definitely check it out!